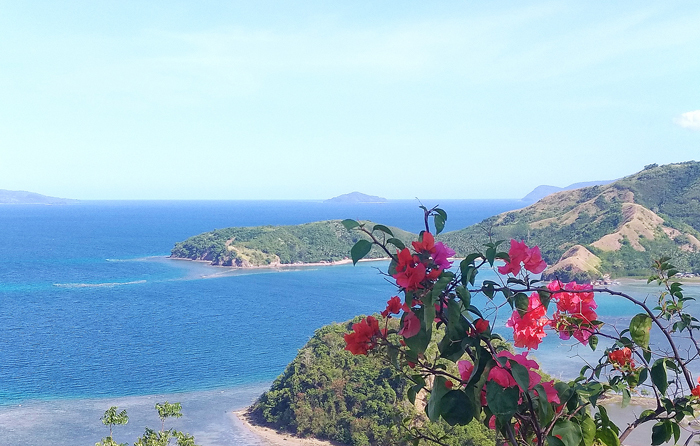 As promised I’m sharing with you our short but sweet trip to Mati in Davao Oriental. 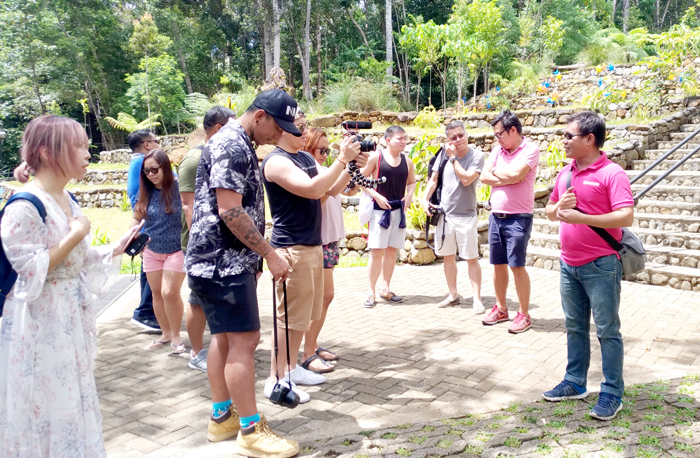 After the successful launch of AirAsia’s newest Santan meal, the Roasted Dalandan Chicken with Pimiento Sauce, which was held in Malagos Garden Resort, we were scheduled to leave for a familiarization tour to Mati in Davao Oriental the morning after. The fam tour was organized and sponsored by AirAsia. We will be travelling with bloggers and influencers from Davao, Manila, Cebu and Malaysia. It’s been a while that I haven’t been to Mati. The irony of this circumstance is that, the nearer and more familiar you are to the place, the less significant your desire will be to explore it. Not because you don’t take pleasure in its beauty but because you would always think - it’s just within reach and you can at anytime drive to see it. And that’s the case relevant to this lazy woman, lol. Using the backyard analogy. They say, backyards are always the underrated part of our dwelling. But most often than not, backyards are the best areas of our house. We just need new perspective to see finery of it. So let’s get to Mati and prove this analogy right. Driving straight from Davao City to Mati City will take only about 3 hours. But if you’re stopping to appreciate the scenery and try out Davao food along the way, then it’ll take a little time more. And so as our road trip case. We spend the night at Malagos Garden Resort and left Calinan at around 7AM. It took us a little time out of Davao City since our van driver observe speed limit. We then have a stop-over for breakfast at Punong Restaurant. It’s a seafood restaurant along Maharlika Highway in Tagum City. Long time ago, we used to fish tilapia here along with my college classmates. It was still then a simple nipa hut by the river. But now they already have able flatboards you can walk through above water, quite an improvement. Our orders came in delayed though, but nonetheless, as always they serve fresh and delectable familiar Filipino seafood favourites. Around 1PM we finally reach Banay-Banay. It’s the town bordering Davao del Norte and Davao Oriental. We stopped for an obligatory picture and meet officers from DOT Davao Oriental who travelled with us to our next stop, Mt. Hamiguitan Natural Science Museum in the Municipality of San Isidro. We reach the foot of Mt. Hamiguitan at around 2PM. 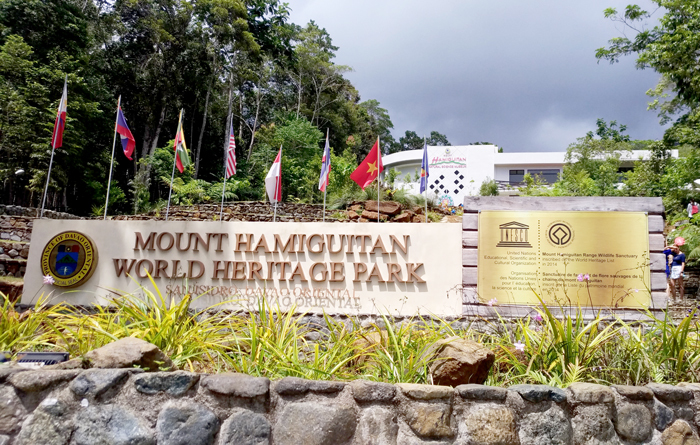 Mount Hamiguitan World Heritage Park in San Isidro, Davao Oriental. giving short brief before entering the museum. 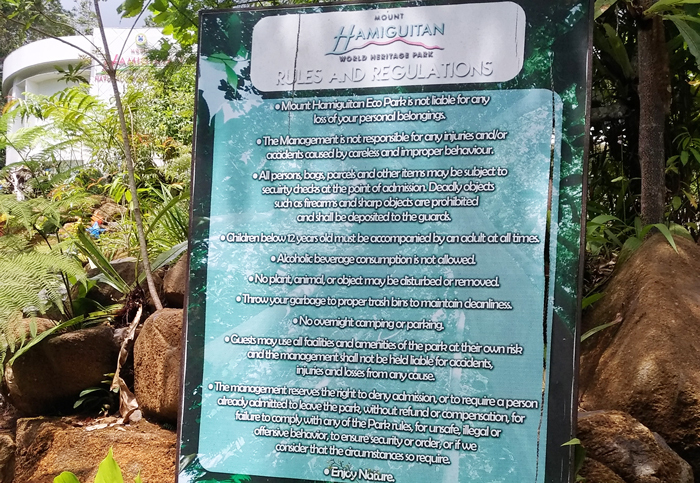 Always follow rules and regulations. I love this art installation. 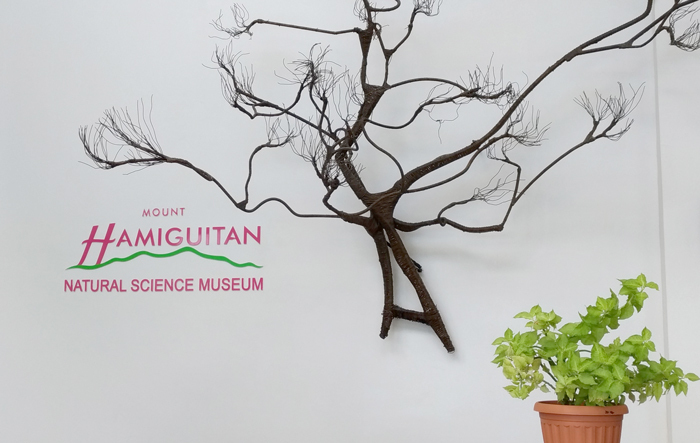 It represent the fragile tropical “bonsai” that crowns Mt. 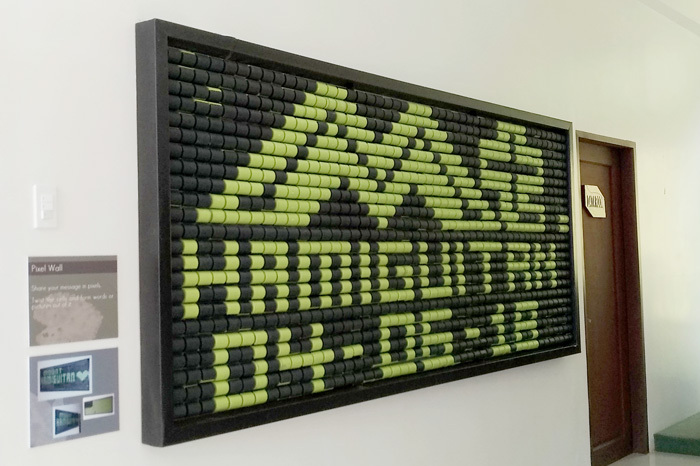 Hamiguitan. Inside Mt. 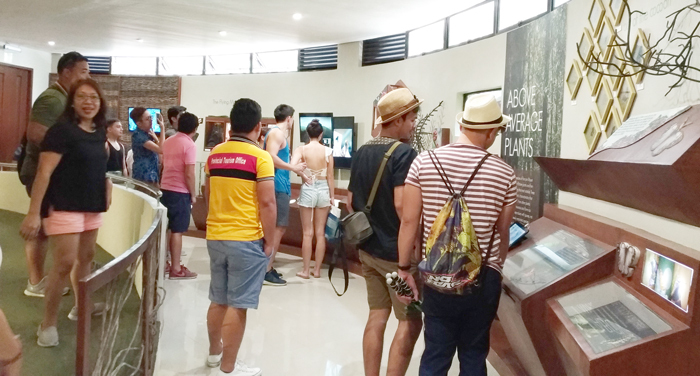 Hamiguitan Natural Science Museum. when you view it with your naked eye. clear characters written on the wall. Love it! After the informative and fun museum tour, thanks to our museum tour guide, Madam Butterfly. We drove back and headed to Mati for a super late afternoon lunch hosted by DOT Davao Oriental. But first a pose for prosperity at Badas view deck. Facebook and Instagram for more of these stories and photos. 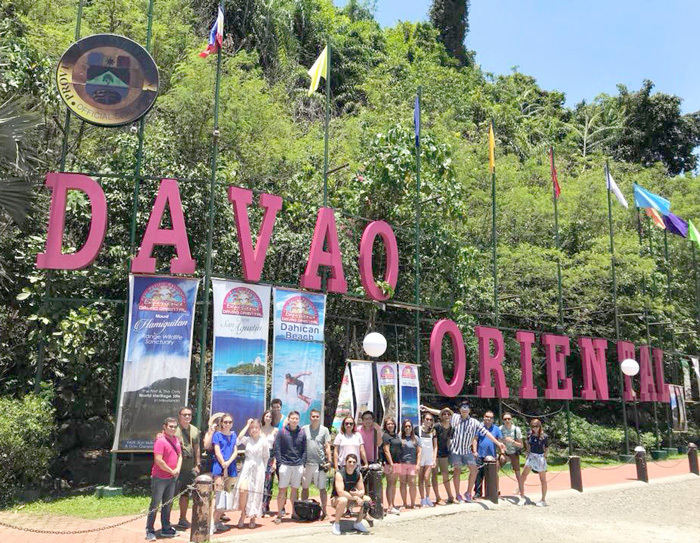 They say you haven’t been to Davao Oriental if you haven’t had your Instagram photo taken with the picturesque Sleeping Dinosaur at the background. So here, I got you one. Our accommodation is nothing short of bliss. 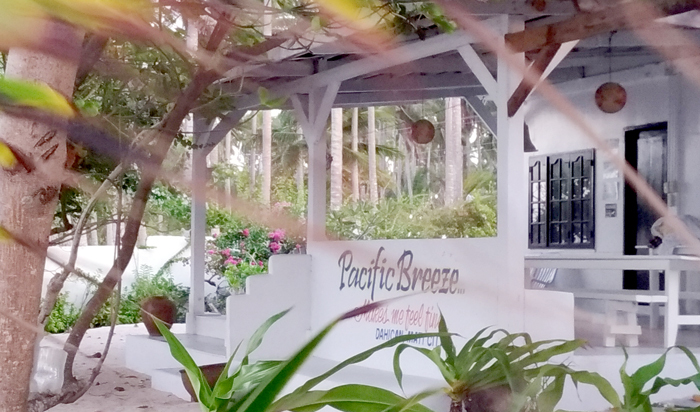 It’s a cosy inn called Pacific Breeze (https://www.facebook.com/pacific.breeze.mati/) at the far end of the long stretch of Dahican beach. It’s nothing fancy but essentials are here; good wifi, running water, airconditioned room and the view and the sound of the ocean lapping the shores are fantastic. Pacific Breeze ... makes me feel fine. 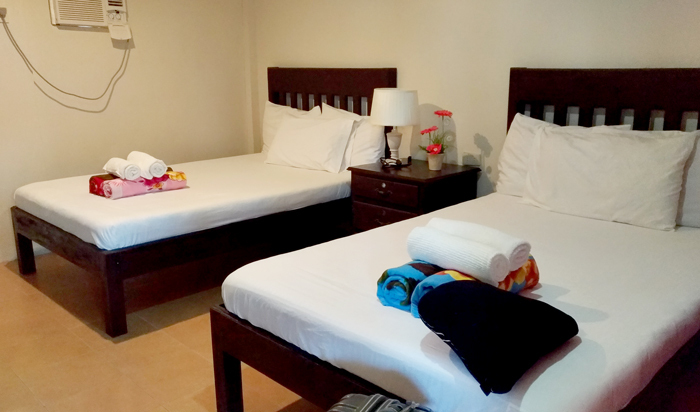 Our twin beds at Pacific Breeze. I haven’t really met and get to know well some of tour pals until after dinner. Cliche as it may seem – that the idea of travelling is not seeing what’s out there or checking things off the bucket list. But it’s about connecting with people you met in the same journey or along the way – is so apt on this circumstance. #AirAsiaInDavao. 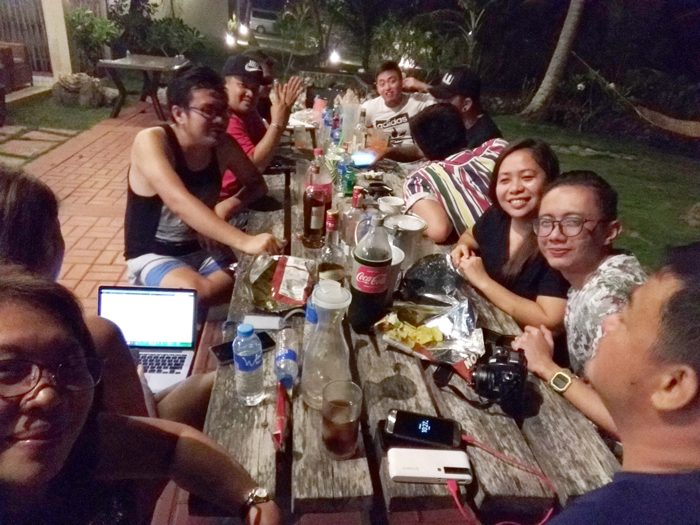 Bloggers and Influencers from Davao, Cebu, Manila and Malaysia. With v/blogger friends from Cebu and Manila. Our Malaysian friends retired early. 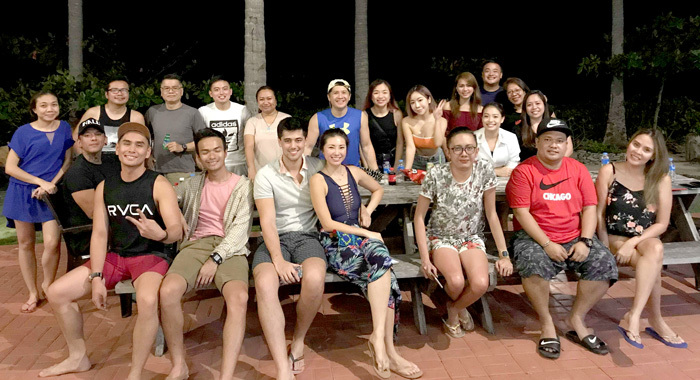 We were blessed to have a beautiful weather that night and we spend it meeting, knowing and connecting with old and new blogger friends from Cebu and Manila. Amazing how sometimes, the most cherished and unforgettable memories of the moment are culled out of the simplest spirits shared on the table. Quote of the night – “This is so much fun.” – G.
We ran out drinks. We squeezed the bottle down to its last drop, hahaha! That only means one thing, enough for now, go rest and see the sunrise ... and so I did! Serenity at its finest. 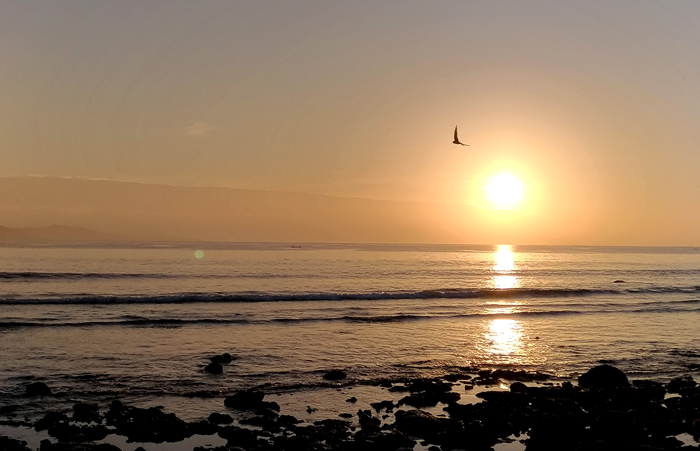 Sunrise in Dahican Beach is nothing short of amazing. Photo time stamp: 5:45AM, April 7, 2018. For every single day that I woke up at home before sunrise, not a chance I’m able to see the sun rising out of the east horizon. When you have school children, you’ll understand why. A mom’s day break from the routine, seeing the serenity of the moment called dawn, is such a renewing feeling. Nature is really astonishing. Ironic how this same spot ooze powerful and raging waves during high seas, yet show signs of utmost gentleness and calmness on moments you feel so vulnerable and seeking solace of the moment. My few minutes of openness here transcends peace and stillness, it’s surreal. Glad I savoured that moment ... because few of my dear friends also woke up and did the same thing from a distance ... and you know what’ll happen next when you have bully friends ... the fun of the day begins. As I have said, this is a short and sweet trip. Our last day was spent at Amihan Sa Dahican watching skimboarding demonstration. We’re one with the young sons of the beach. 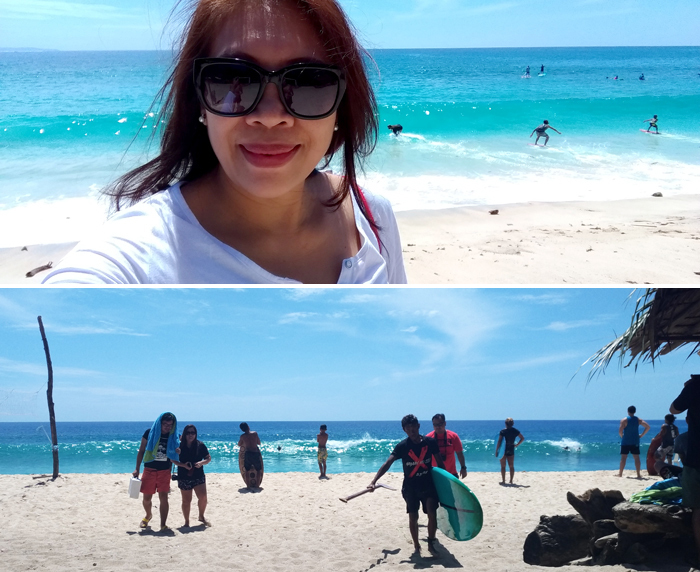 Dahican Beach is a 7-kilometer crescent-shaped, white sand beach in Mati, Davao Oriental. It's lined with tall coconut trees and a nesting area of Hawksbills and Olive Ridley sea turtles. It's turquoise waters that form part of Mayo Bay that faces the Pacific Ocean is also home to other endangered species, like sea cows (dugong), dolphins and whale sharks. 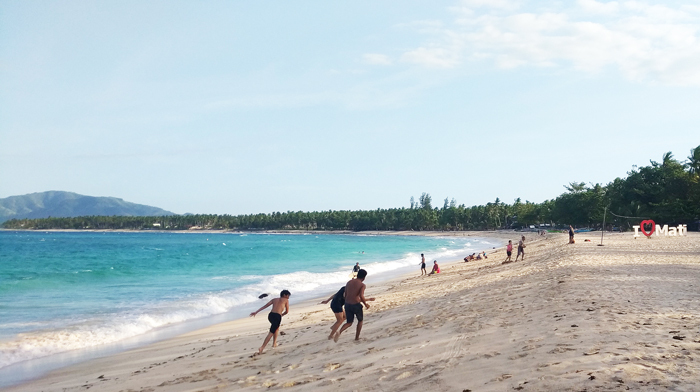 Amihan Sa Dahican is located along the 7-kilometer crescent-shaped, white sand Dahican Beach. It’s popular among surfers and skimboarders because of its strong and high waves. It also boasts unpolluted, turquoise waters that are part of Mayo Bay that faces the Pacific Ocean. This is one of the things you must-do when in Mati. Experience how to skimboard. Honestly, it looks easy on the eyes, but gosh! This is so physical, I need more ‘balut’ for the ‘tuhod’ for this one. They might be kids but they’re master of the waves. They go to school during school days and since its summer, they do what they do best – playing with the waves. They’re trained by the wave master himself, Jun Plaza. They also participate in surf and skim competition from time to time. You can also contract them for a lesson for P200/hour. Skim and Surf equipment are also available for rent. 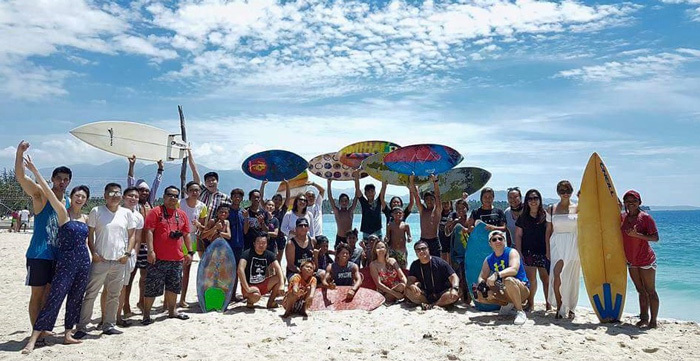 with the skimboarders and surfers at Amihan sa Dahican. And that concludes our short and sweet Mati trip. We drove back to Davao City at 1 PM and luckily our friends flying out of Davao made it to their flights. Thank you so much AirAsia for bringing us to Mati, Davao Oriental. It was nice seeing this place again! 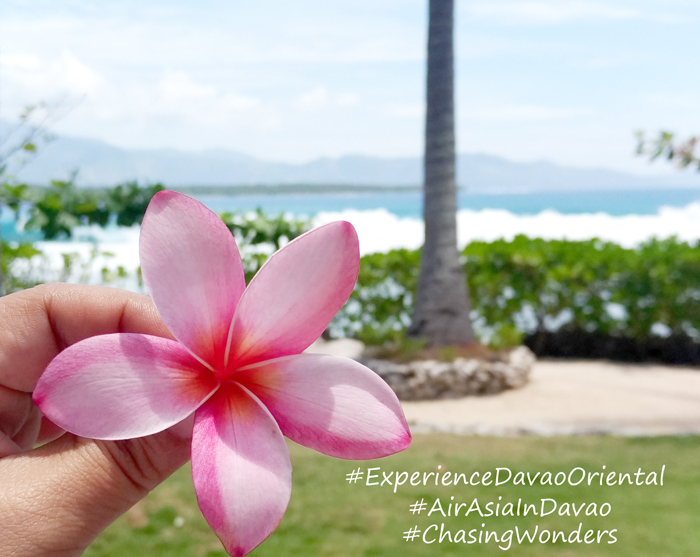 To the people of Davao Region and Mindanao, you don't have to go far to experience travel bliss, it's waiting right in your backyard. To Yen Dreyfus of AirAsia, who tirelessly keep us company, daghan kaayong salamat, Yen! If you want to come, visit Mati and experience Davao Oriental, AirAsia flies to Davao City from Manila, Clark, Cebu and Kuala Lumpur. Book your tickets today and start chasing wonders, visit; http://www.airasia.com. I've posted more photos here, enjoy!